The dried meat product known as beef jerky is rich in protein and a favorite snack of outdoor enthusiasts because it doesn't require refrigeration. Homemade jerky is usually good for about two weeks when stored at room temperature in a sealed container. Storing it in the refrigerator or freezer can extend its shelf life. 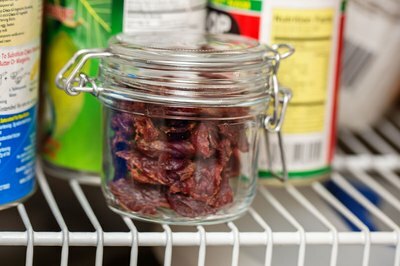 Beef jerky will last from two weeks to two months when stored in a cool, dark pantry. The jerky retains its texture and taste best when stored in food-grade vacuum-sealed bags, which prevent the meat from oxidizing and becoming moldy. Airtight glass jars, metal jars or resealable plastic bags also keep jerky free of moisture. 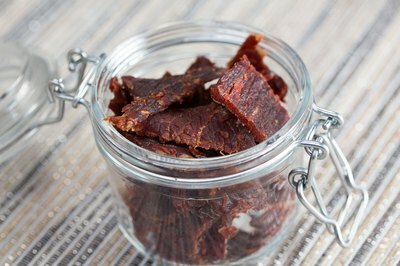 Store containers of jerky out of direct sunlight, preferably in a cabinet, and away from the heat of your stove or other kitchen appliances to prevent it from spoiling. Beef jerky that has gone bad will smell unpleasant; become darker in color and harder in texture; or have visible mold. While it doesn't require refrigeration, beef jerky can last as long as six months in the refrigerator at 40 degrees Fahrenheit or less, according to the Oregon State University Extension Service. When stored in the freezer, homemade jerky can last as long as a year at 0 F or below. EatByDate: How Long Does Beef Jerky Last? U.S. Food and Drug Administration: Are You Storing Food Safely? Which Fruits Should Be Stored in the Refrigerator?